Hitching A Ride On The World's Biggest Cargo Ship : Parallels Launched in August, the Maersk McKinney Moller is the first of a new class of megaships. It's 20 stories high and a quarter-mile long. NPR's Jackie Northam hopped on board in Poland. 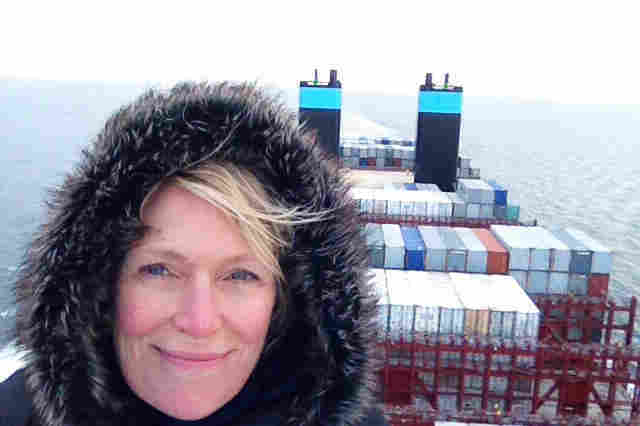 NPR's Jackie Northam on the Maersk McKinney Moller, a new container megaship that can carry about double what many other big cargo ships can carry. It's 20 stories high and four football fields long. I started my journey at the famed Gdansk Shipyard, home of Poland's solidarity movement in the 1980s. It was nearly midnight when I arrived and saw for the first time the Maersk McKinney Moller, the world's largest container ship. I simply wasn't prepared for just how massive it is. The whole ship really can't be taken in, even standing at a distance, so I gave my neck a good stretch by scanning this behemoth end to end, and up and down. That sense of scale was reinforced when I walked up the ship's steep gangway with Mikkel Linnet, a communications officer with Maersk. The ship's third officer, Siddhesh Naik, joked that most visitors ask where the elevator is because you need to climb two floors just to get to the main deck. Everything about this ship is big. Each link, or lug, in its anchor chain weighs about 500 pounds. It can carry more than 2 million bicycles or more than 100 million pairs of shoes. It sits 240 feet high, roughly the same as a 20-story building. It's 1,300 feet long, or a quarter of a mile, and 200 feet wide. It can hold more than 18,000 of the standard 20-foot containers — about double what many other megaships can carry. If you put each container end to end, the line would stretch for about 70 miles. And that's why we were already delayed by 12 hours. It was taking longer than expected for Polish longshoremen to finish loading and lashing down the thousands of containers carrying anything from electronic goods to furniture. Throughout the night I could hear the gigantic cranes hoist up containers — many weighing up to 25 tons — and stack them on this massive vessel. 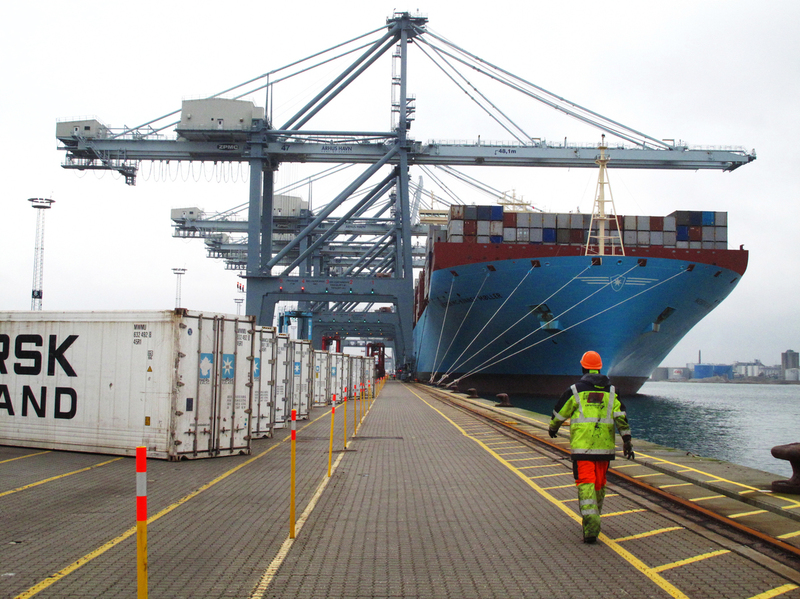 The size of the Maersk McKinney Moller can also present challenges getting in and out of port. As we left Gdansk, the Danish captain, Jes Meinertz, sipped coffee and watched a Polish pilot deftly maneuver the ship around three nearby piers and into the open waters of the Baltic Sea. 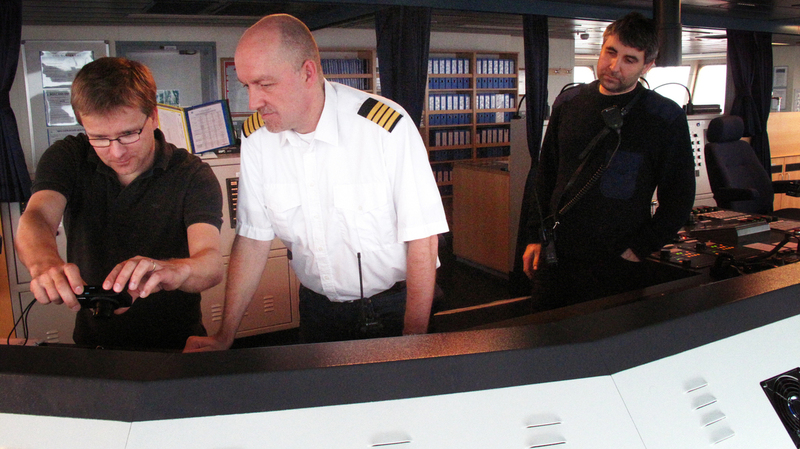 Captain Jes Meinertz (center) and pilot Pawel Pidzikiewicz (right) take the ship out of the port of Gdansk into the Baltic Sea. The Maersk McKinney Moller was just launched last summer and is the first of a new class of megaships known as the Triple E. The vessel has that new car feel to it. Everything is clean and bright, and the crew is still familiarizing itself with all of the new bells and levers and whistles. The ship was built to shuttle between Asia and northern Europe, the world's busiest trade route. No U.S. port can yet handle a ship this size. Several European ports improved their facilities, dredging their waterways and upgrading the size of their cranes in order to unload containers from this superwide vessel. Meinertz says the Chinese are constructing new terminals at an amazing rate. "They are just building more and more terminals, bigger and bigger terminals. You have so much more gear available when you come alongside than in some of the European ports," he says. It was in 2010 — during the global recession — that Maersk Lines made the decision to create this new class of megaship. Michael Heimann, senior portfolio manager at Maersk Line, was part of the development team. He says the challenge was coming up with a design that was at least 30 percent more efficient than other big container ships. They needed to think "in different ways than what we had seen in ship design before," he says. Maersk McKinney Moller at port in Aarhus, Denmark, shortly after arriving. Heimann says Maersk made changes to the ship's engine size and its propellers, and it improved ways to capture energy to more efficiently power the vessel. The ship moves 2 to 3 knots slower than others, which cuts both CO2 emissions and fuel costs — the ship's biggest expense — by at least half. 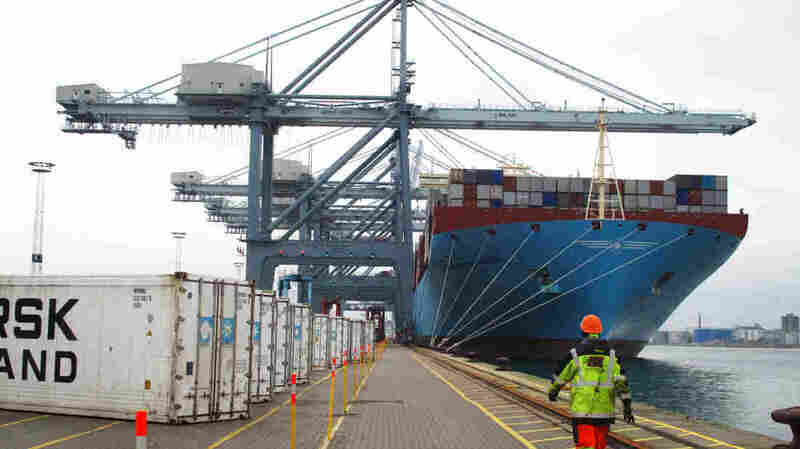 Maersk also made fundamental changes to the shape of the vessel in order to get as many containers on board as possible. It's economy of scale, Heimann says. "Obviously, the more containers that we can put on, the more containers that have to split the cost of the fuel on," he says. Richard Meade with Lloyds List, a shipping industry news provider, says that's a great argument, but only if the ship is fully loaded. "A ship like the Maersk McKinney Moller is a fantastic advance for the industry, as long as it is full. If it is half-empty, it is probably one of the most inefficient ships ever built," Meade says. "That is the great gamble." It's a gamble Maersk is willing to make, based on the belief that global trade will bounce back from the recession. The company ordered 20 Triple E vessels from South Korean shipbuilder Daewoo at $185 million apiece. Half a dozen of the ships are already on the water. Other shipping companies have also placed orders for similar-sized vessels. Stephen Schueler, chief commercial officer for Maersk Line, says it's starting to see the ships fill up. "We're very encouraged by the utilization, or the vessels being full," Schueler says. "In this year so far, I would say we are almost completely full." On my second night on board, we headed into Danish waters. My jet lag prevented sleep, so I wandered around the ship. The massive containers stacked on deck were silhouetted by moonlight. I felt like a speck standing next to them. I walked onto the bridge, where the glow of the instrument panels cut through the darkness. After a few moments, I could see a horizontal chain of lights just ahead. It was Denmark's Great Belt Bridge. I could feel myself duck as we went under it. There was only a 20-foot clearance between the top of the ship and the bottom of the bridge. Within hours, we reached the port of Aarhus, Denmark, where I got off the ship. I walked down the long gangplank then onto the pier, taking one long last look at the Maersk McKinney Moller, a ship in a class of its own.